American foulbrood (AFB) is the most devastating honeybee disease. AFB kills the infected colony. It's high virulence also means it can easily be spread to other colonies within foraging distance. 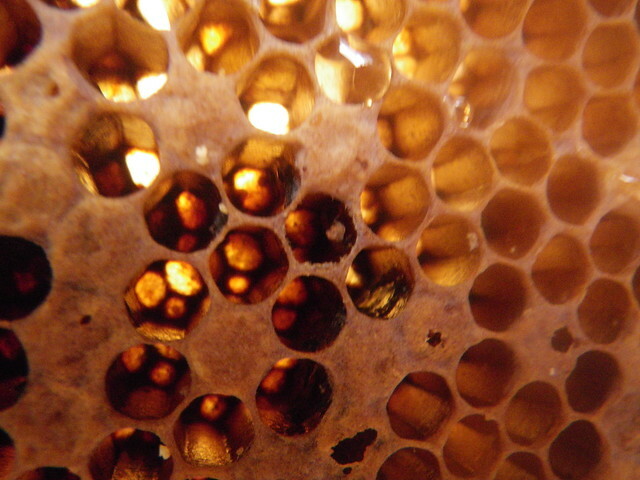 Spotty brood pattern on a comb infected with AFB. Via Flickr. 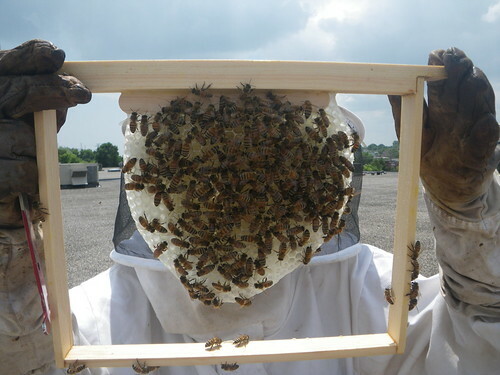 Not only do you loose your bees, all comb and frames must be destroyed to prevent further infections. Even a small outbreak can be both heart breaking and expensive. Being able to confidently diagnose AFB is critical. 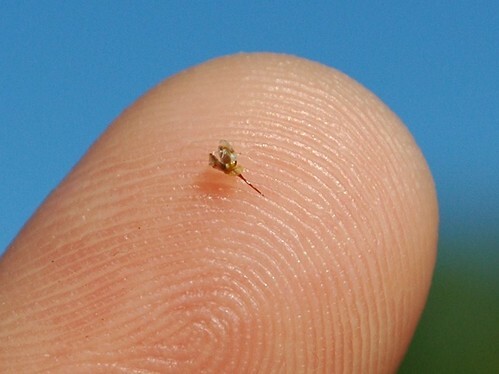 Spotting AFB in the early stages allows you to take immediate action and reduce the severity of impact to your apiary. More information and illustrations can be found on the Ontario Ministry of Agriculture and Rural Affairs web site. Infected comb with AFB scale and perforated brood cells. Via Flickr. Protocols for dealing with AFB vary vary slightly by region. Typically one must report the disease and burn infected equipment. Some areas do allow you to keep hive boxes as well as outer and inner covers if you scorch them with a blow torch to kill spores. You might even be able to save your comb if you are willing to pay to have them irradiated. 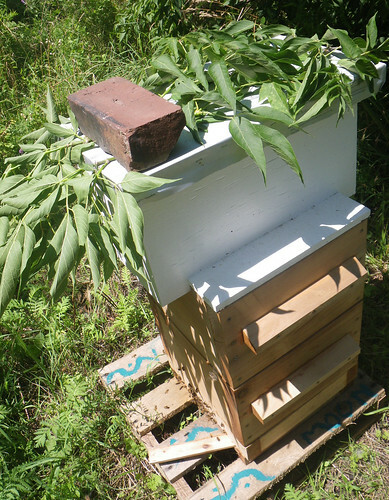 A few jurisdictions do permit you to try and save your bees using the shake method. While people have reported success with this method, areas that permit shaking bees with AFB almost always have a higher overall infection rate. As a very basic precaution, it's useful to scorch hive tools before opening different hives. This can be done either with a propane torch or by placing your tool in a smoker. 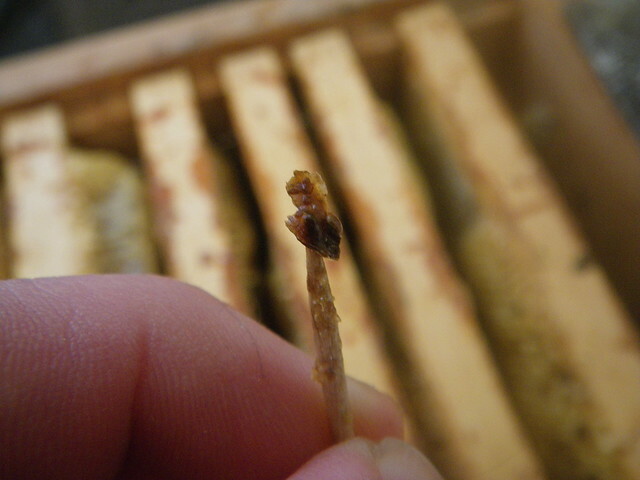 You want to see the propolis on your tool boil. There is also some suggestion that poor nutrition can leave bees more susceptible to AFB. For example, a lack of lactic acid bacteria (LAB) found in honeybee's gut may diminish their ability to ward off the disease. In one experiment LAB levels were charted based on bee feed type (see pg. 15). In some parts of the world antibiotics are fed to bees to mitigate the risk of contracting AFB. Unfortunately, this has given rise to strains of American foulbrood developing resistance to particular antibiotics. A few other tips to help limit the spread of disease can be found here. 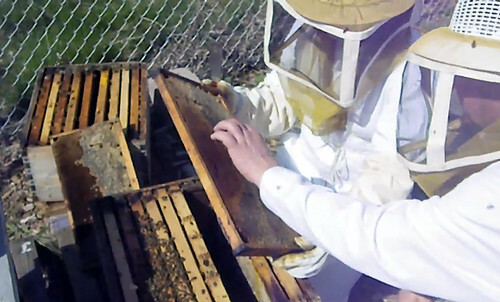 Nice short video portrait of Ontario beekeeper Robert Ireland. His form of apitherapy sounds rather unique, I'd be curious to learn more about it. The winter of 2013/14 is perhaps the coldest winter I have ever experienced in my life. Bees in the area were hit hard. 60% of the colonies in Ontario did not make it Relentless cold temperatures meant very few cleansing flight days till April. By the end of April this was our only viable colony left. 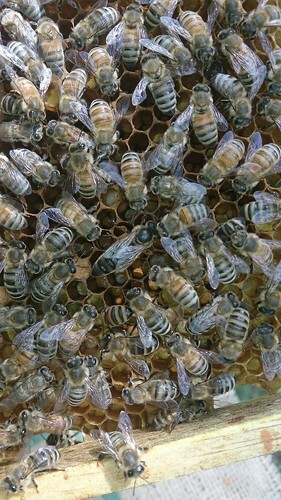 A few other colonies made it into spring, but there populations were to low to reproduce. They were not in great shape though. No cleansing flights meant lots of dysentery in the hive to clean up. Below is the small cluster of survivors on April 21st. 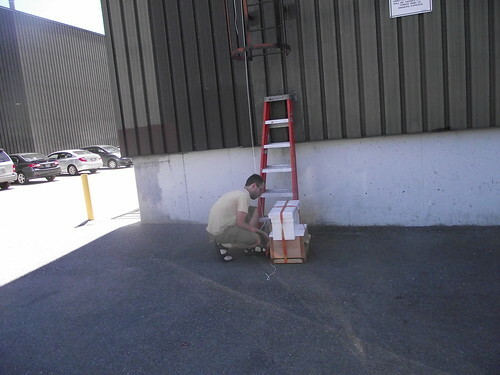 They did have a lot of honey left in the nuc adapter box, as well as the top warré box where they were clustered. So as they spring nectar flow started, we harvested the honey left in the nuc, and added in warré frames containing honey from their neighbour hive which did not make it through the winter. Thus the transition from langstroth to warré was complete. In retrospect it probably would have been better to have removed the transition box before winter, or have insulated it better. It wasn't designed with the same thickness of wood as the rest of the hive, and I believe it did not help conditions in the hive over such a cold winter. 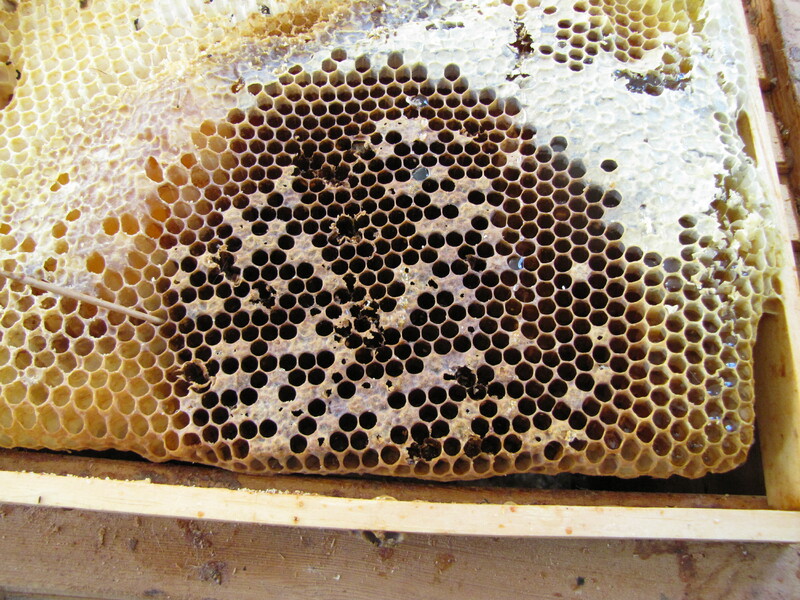 Where the cluster finished the winter, and started to raise brood was on a frame that was only about half worker cells, and one of the adjacent combs didn't have any worker cells. I suspect this further slowed their spring development. It also suggests that I need to be more strategic when using natural comb in anticipating where the cluster will end up in the spring. 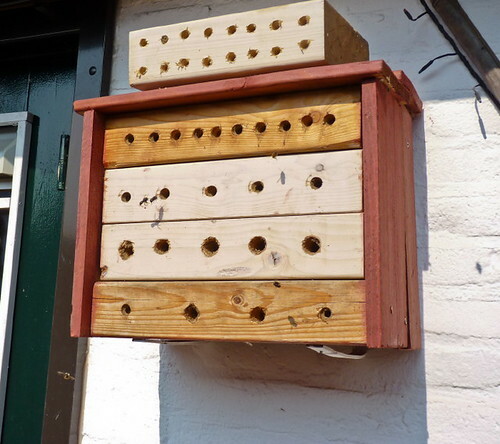 We moved the brood box to the bottom, and tried to place more appropriate comb near the brood nest as best we could. They expanded the brood nest upward by late may, and it was the middle of June before they had 5 frames in the second box and one below. By the end of June the population was starting to look a little more reasonable. They were starting to fill in what space was left around last falls honey in the top box, it was hot, a strong flow was on, so we decided to add a new box. We were eager to take advantage of what we feel is probably the best time of year for comb building, and wanted to reorganize them onto a more compact brood nest. We tried to sort the best brood comb into the bottom two boxes with 6 new frames for them to draw. 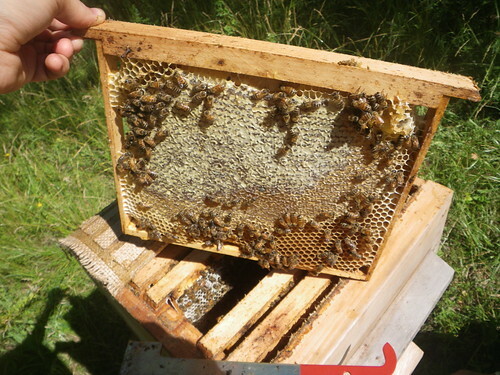 We moved combs that were not primarily worker comb to the new box in the 3rd position with two new combs to draw. 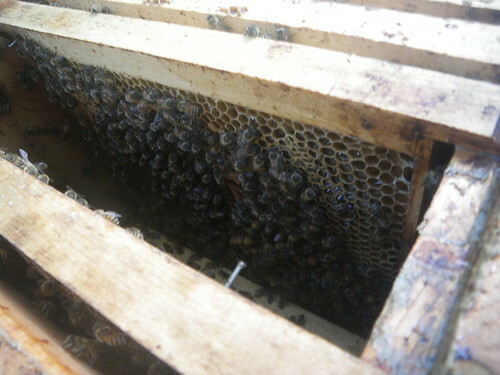 but in the bottom box there were no eggs where capped brood had hatched and the new combs were not significantly built. There was a fair bit of pollen though and still a bit of capped brood. 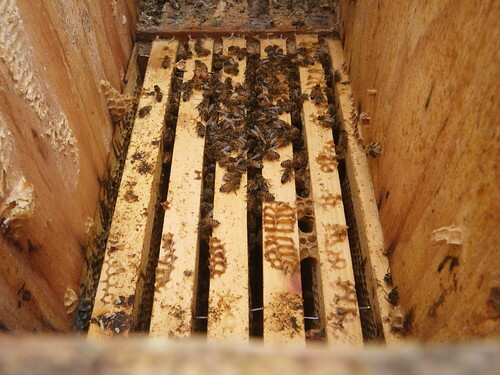 They had prioritized comb building a little more in the second box, and we did see some eggs in here. 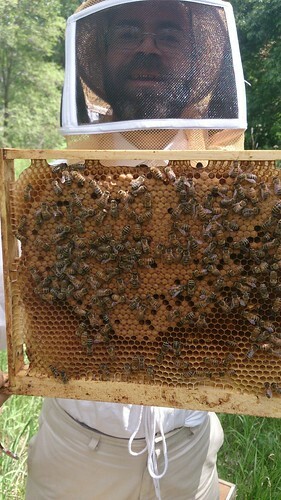 3rd box had a fair bit of brood, but some capped honey and nectar up her too. 6. How well do you know the neighbourhood? Whether rural or urban, beekeepers rarely (if ever) have the luxury of controlling the entire forage area of their live stock. The moment your bees fly out from the hive, they are at the mercy of the surrounding community. Bees are opportunistic; if there is something interesting and abundant close by, they may not travel all that far from the hive. If pickings are slim, however, bees will extend their search. Even at six kilometres away from flowers they will still manage to produce some amount of honey, though ideally they will have many foraging options within one kilometer. 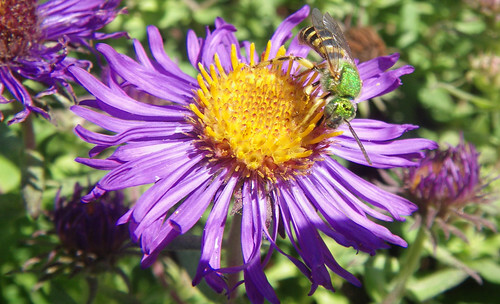 You want to look for an area that has at least an acre's worth per hive of a variety of honey bee friendly flowers blooming throughout the year. At the same time, you want to be cautious of things that may spoil your honey or cause harm to your bees. For example, hives in new york city ended up producing an unusual bright red honey after the bees discovered the maraschino syrup at a cherry factory. Last summer, after a few months at a new location, I noticed a waste transfer facility near by, and it suddenly dawned on me that proximity to this trash site was probably a significant factor in explaining why I had so many wasps going after my bees. 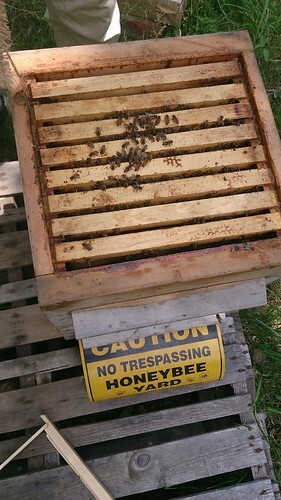 One of the interesting things about keeping bees is how acutely aware they ask you to be about interconnections in the broader ecosystem surrounding you. It will be impossible to anticipate everything, but familiarity with the community will help guide you to good locations and steer you away from potential problems. 7. What makes bees grumpy? A beekeeper is going to get stung from time to time, but it doesn't need to happen all the time, and ideally, the non-beekeepers around you will never ever catch a sting. The source of some problems, like the weather, are completly out of your control, but there is almost always something you can do to at least mitigate an unpleasent situation. 8. Where will the bees get their water? 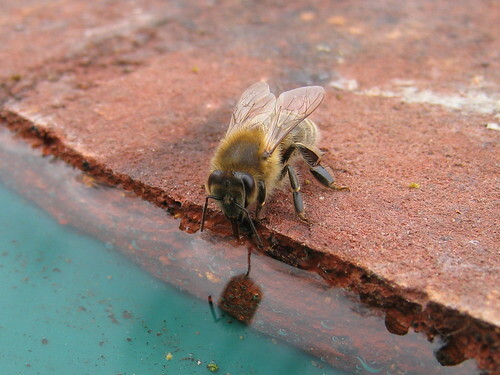 Bees collect water to use for a variety of purposes. The classic problem this presents for city beekeepers is the swimming pool lined with thirsty bees scenario. 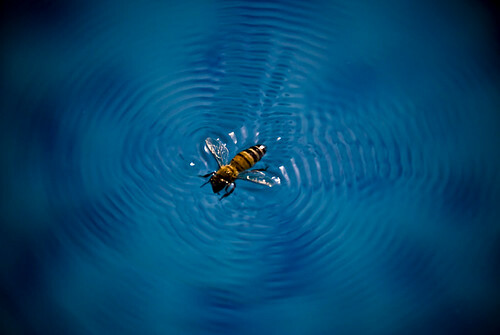 Less obvious water sources, like a leaky water faucet in a neighbours yard, may also lead bees to congregate in places where they are unwelcome. You can try to provide a water source of your own, but training them to it from the beginning, and ensuring distance from potentially problematic water sources will make this easier. 9. What factors do I need to consider while locating hives on my site? 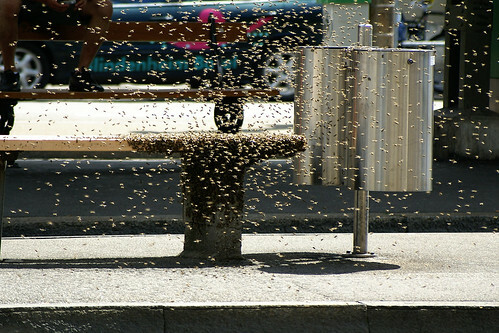 You don't want the flight paths of your bees in, out and around the hive to cross people paths. In Vancouver, it's required to use an obstruction like fencing or hedges, if not placements at higher heights to keep bees up and over the heads of neighbours. Personally, I'm a big fan of rooftop beekeeping. Rooftops that are fairly private can provide you with a nice safe space away from other people. With the frosty winters my bees experience in Canada, a little extra residual heat rising up from a heated building, or off the side of a brick wall is a plus. 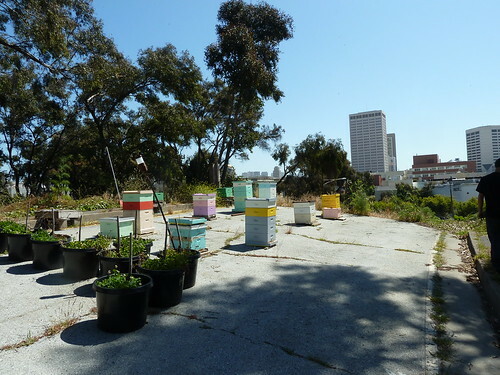 The down sides to rooftop hives are that a) they are more likely to be exposed to wind; b) it can get a little too hot in the summers; and c) if you are going to depend on a ladder for access, harvesting heavy boxes of honey takes a little more thought and a great deal more effort. 10. What is my population growth strategy? 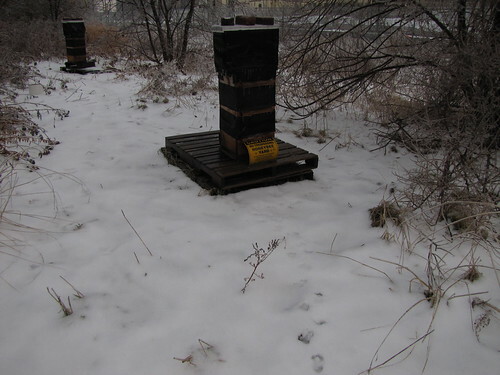 The areas surrounding an urban apiary are not particularly wild. 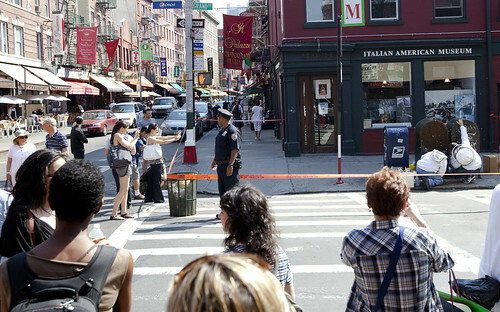 There have been a number of stories in the media where bees ended up closing busy streets. 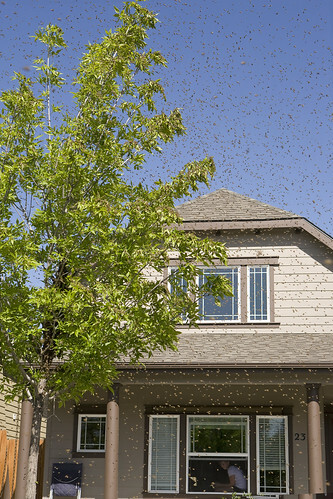 It's also common to hear about property damage caused by bees moving into the wall of house. On the continent where I live the honeybee is an introduced species. 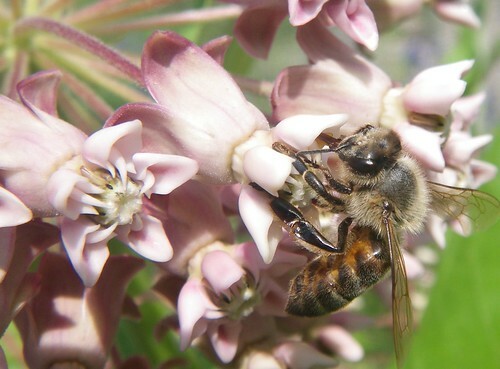 Increasing the population of feral honeybees decreases the potential for you and other beekeepers in the area to produce a local food product without impacting the wild native pollinators. Identify when it is happening and attempt to prevent it. Manage your colonies in such a way that any increases are only temporary. In this day and age in particular, so long as you are prepared, a case of too many colonies is a wonderful problem to have. 1. 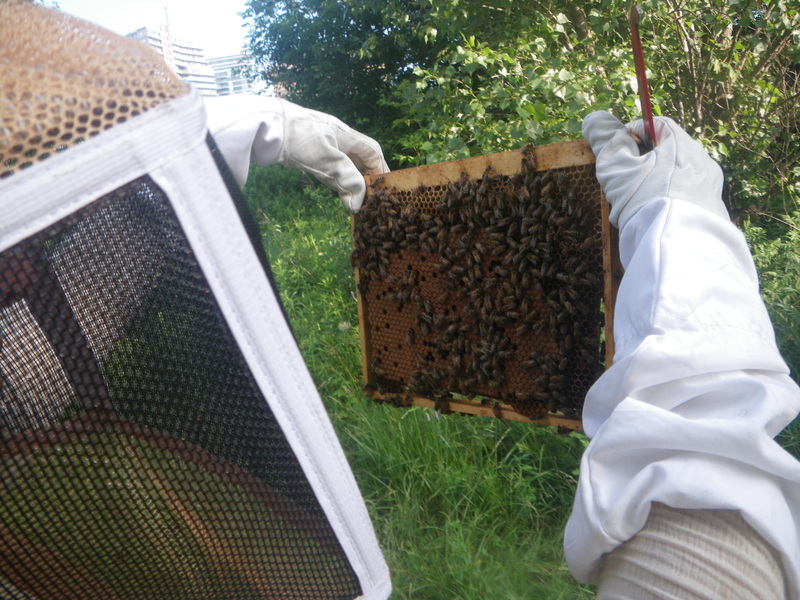 Why do I want to be an urban beekeeper? City bee feasting on goldenrod. In light of all the recent media attention given to mass bee deaths, there has been a dramatic increase in people getting into urban beekeeping with the hope of saving the bees. Certainly, the value of bees as pollinators is monumentally important for the web of life on this planet, and this is a very worthy cause to take on. What's important to consider is that we most often hear about honeybees in the media due to their importance in modern industrial agriculture. There are, however, 20 000 different types of bees, many of them facing serious challenges, without a fraction of the people looking out for them that the honeybee has. If your goal is to save the bees, you may wish to devote your energy towards providing habitat for the other types of wild bees rather than honeybees. In fact, researchers from the university of Sussex have suggested that large numbers of new urban beekeepers populating cities with honeybees could be threatening the health of other types of bees as it leads to increased competition for limited resources. If you're interest is honey production, the ideal choice in many parts of the world is the honeybee. My understanding is that locally produced honey has about as low an ecological footprint as you can find in a sweetener, so maybe there's room for noble cause cred looking at it from this angle too. There are, of course, innumerable other reasons to keep bees. Ask yourself what you hope to get out of the experience. This will put you in a better position to find a path into urban beekeeping that best suits your desires. 2. How much time does it take to keep bees? I always find this question difficult to answer as I am the sort of person who's always trying to spend more time with them. I can say that at minimum, particularly in densely populated urban areas, it's responsible to check your bees for signs of swarming once a week in the spring; a swarm typically waits till some of the new queen larvae they are raising are nine days old before departing. 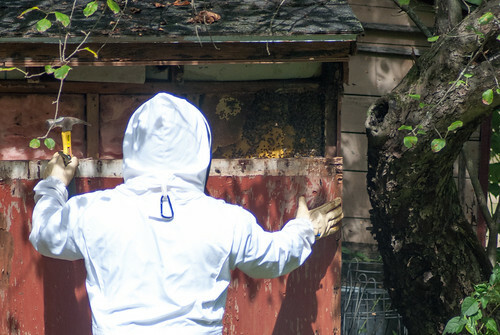 With experience, in the summer and fall it is theoretically possible to get away with a few weeks between checks if your timing is strategic and all is going well with your hives. There are, of course, situations that may arise where a colony needs some attention a few days in a row. In my mind, time spent looking in the hive is really the tip of the iceberg. Especially in the beginning, getting yourself prepared for your hive checks, both in terms of knowledge and equipment, can take up more of your time than anything else. Proper preparation allows your checks to be as purposeful and efficient as possible and will save you time in the long run. You will always need to be budgeting a few hours here and there for putting together that extra hive box, sorting out a feeding system you didn't think you would need, figuring out what a weird unexpected behaviour is all about, etc. If all this sounds daunting, anticipate that one day you will discover a sudden urge to buy flowers for your lovely fuzzy buzzing ladies. At this point you may very well say something to yourself along the lines of: 'one does not count the hours when one is in love'. 3. 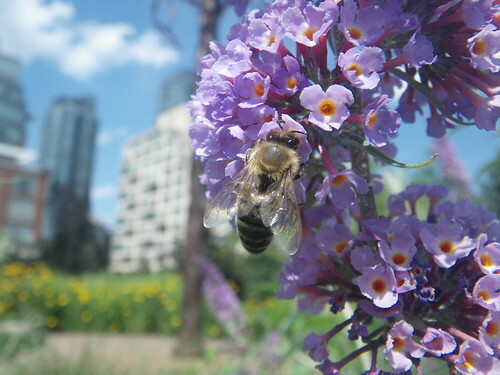 What are the regulations around bees in the city? 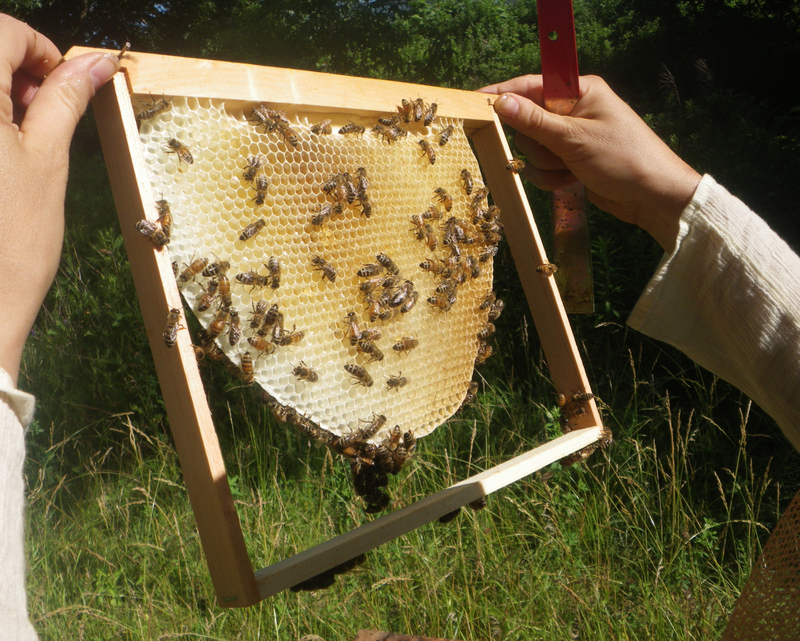 Laws surrounding beekeeping vary dramatically by municipality or province / state. See the bottom of this page for Canadian info. This Forum thread contains links to regulations for many American states. 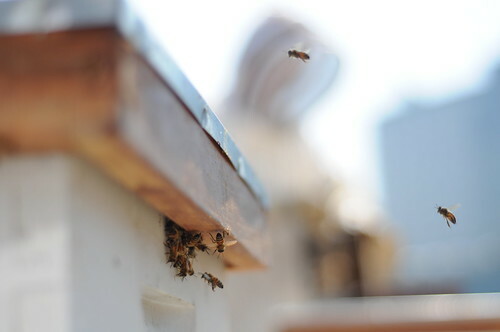 In some cities beekeeping may not be permitted at all, while other cities may require such things as: limits to your hive numbers, meeting specific hive distance or position criteria, taking some form of training, registering your hives, and following certain management practices. a) To protect other beekeepers from the spread of pests and disease. b) To protect the public from safety risks. You will likely find it upsetting if you discover that your municipality is less permissive than some other urban areas. The laws in your area may very well be unreasonable, but keep in mind that your fellow neighbours and beekeepers really do deserve some level of real respect. 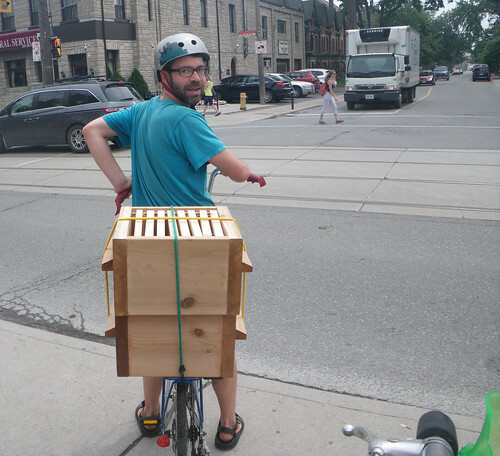 I keep bees in Toronto, where provincial regulations specifying that hives be placed 30 m from property lines make it impossible to keep bees legally in your backyard. Nevertheless, a fairly large contingent of us have been creative in finding suitable, legally compliant sites. 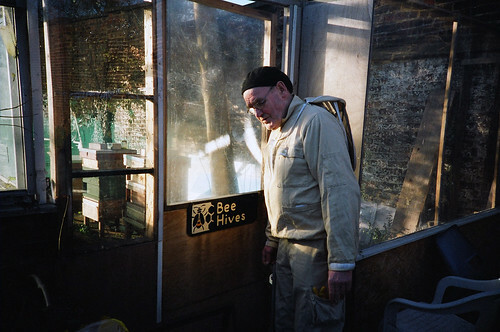 In my context, I have little interest in breaking the law for bees - I'd worry my beekeepers liability insurance would not be honoured if I kept illegal hives, and I feel it's probably better to give bees some space anyway, so I'm happy to go a little out of my way for the privilege of keeping bees. 4. I've never kept bees before, how do I learn? Beekeeping where there may be only a small buffer zone between other people and an unexpected bee problem means beekeeping with raised stakes. Knowing as much as possible about what you can expect in different situations before setting up your own urban hives will go a long way in reducing your stress levels and reducing the risks involved with keeping bees. There's no substitute for first hand experience. 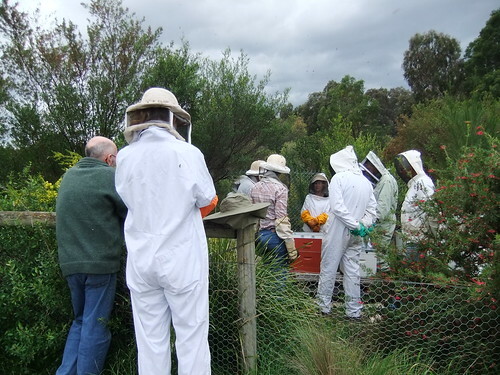 As a beekeeper’s focus and activities can vary a fair bit at different points in the season, courses that bring you into the bee yard at different times of the year are preferable to more intensive workshops that try to cover everything in a single day or weekend. Local beekeepers’ associations are fairly common around the world. Attending their meetings is an excellent way to meet other beekeepers who might enjoy some help around their hives and be willing to mentor you. Do still read as much as you can. Ideas on how to do things vary wildly among beekeepers, and in some cases different resources will outright contradict each other on what would appear to be statements of fact rather than personal preference. As they can't all be right... well, at least not all of the time… familiarizing yourself with some of the different schools of thought may equip you with a broader ability to interpret what is actually happening with your own bees. For this same reason, I recommend seeking out the more in depth resources right from the start, rather than looking at the 'quick starter guide' style of resources. 5. 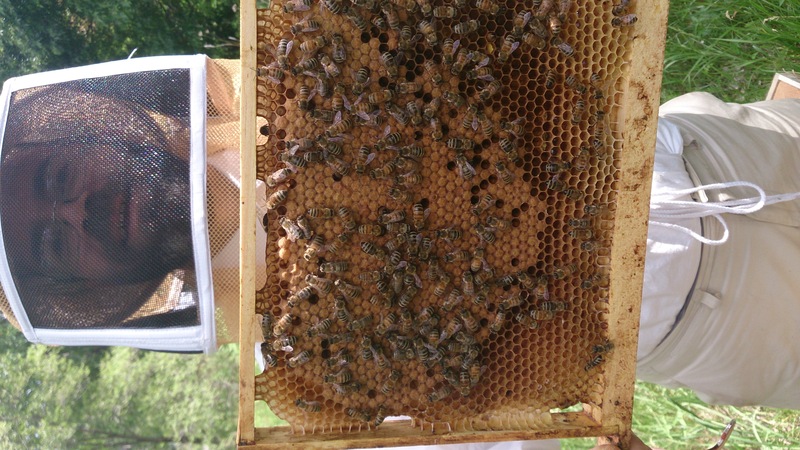 Will a backyard hive impact my neighbours? On an emotional level, the presence of a beehive tends to elicit a strong response. Some will be excited and think you're amazing, while others will be terrified and think you're insane; only rarely will people be completely indifferent. There's somewhat of a divide in opinion as to whether or not to tell your neighbours about your new hobby. Some will argue that you should attempt to be stealthy and subtle lest some mean spirited or overly paranoid neighbour starts making things difficult for you. On the other hand, I would suggest that there might be some advantages to being up front about your plan, as there is a good likelihood that the people around you will, sooner or later, notice the sudden propensity towards white jumps suits and veils in your fashion selections and the 80,000+ bees that are being sheltered a few feet away from their family home. There's been a great deal written about the gentle, docile nature of the honeybee. For the most part I agree, bees are primarily interested in flowers and have little time for picking unnecessary fights with people while away from the hive. 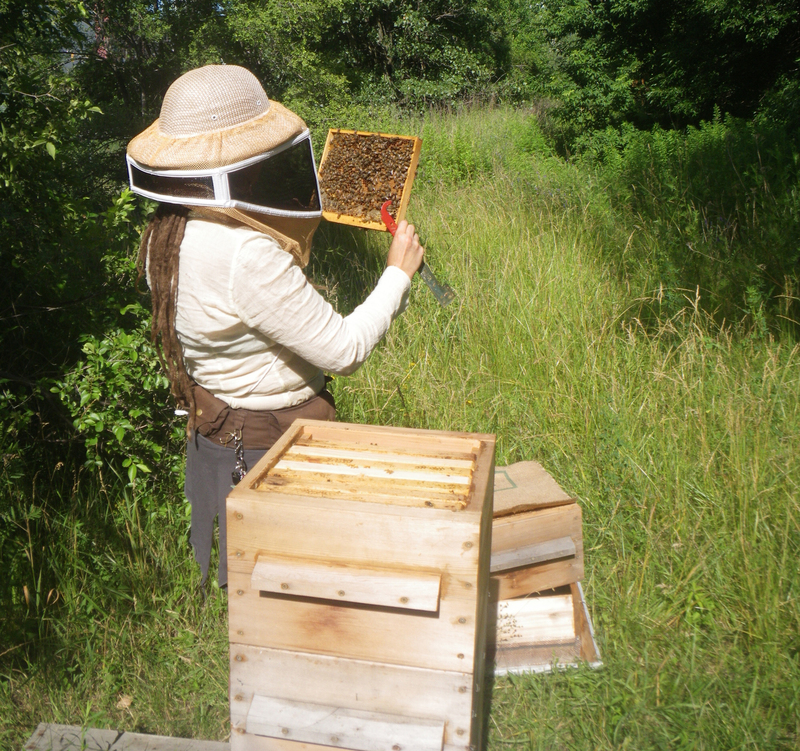 I'm often able to sit peacefully beside my unopened hives without any protective equipment. 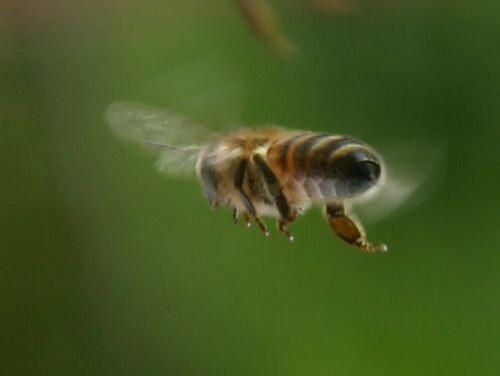 At 10-20 feet, without a direct line of vision to a hive, it can be difficult for your average person to even notice that bees are flying around them. This, however, does not mean beekeeping is a risk free activity. There are a few situations that will come up that can change the mood of your bees, as well as increase the potential for a negative encounter between human and bee. Examples of such situations include: a nectar dearth that necessitates that you feed your bees, some methods of honey harvesting, allowing a colony to swarm, or an accidental dropping of a frame or a box full of bees. Do I need a queen excluder? The simple answer to the question is no you don't need a queen excluder. In fact, I prefer not to use them most of the time. Why I feel that way is best explained by this video where you can see very clearly that some worker bees are struggling to pass through an excluder. They may not all be as restrictive as the model in this video, but I believe it illustrates why you will find many references to beekeepers calling it a 'honey excluder'. But won't I end up with brood in my honey? Probably not. 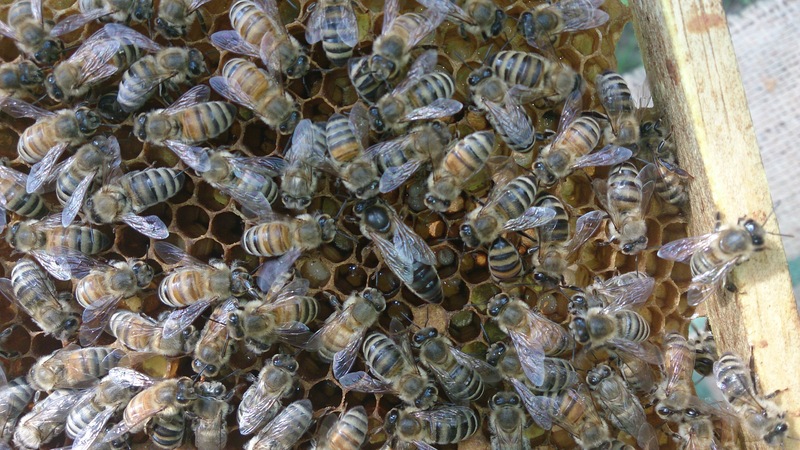 The queen wants to lay a tight compact brood nest and the bees prefer to store honey above the brood. Even if a prolific queen extends the brood nest into a honey super, the worker bees will likely be eager to fill this space with nectar again once the brood hatches. Dearth's can also complicate things. If the bees are eating more honey then they are bringing in, they will start moving the brood nest upwards as they eat through their stores. Even though I find some of these situations described above inconvenient at times, I also believe the bees behave this way for a reason, and suspect there can be value in allowing them the freedom to make the choices they feel are optimal in a given situation. Some instances where a queen excluder can come in handy include making splits, raising queens, and locating a particularly elusive queen. I've worked bee yards for years where excluders where used by default. The bees still stored honey in the supers and it did guarantee that the queen stayed below. We found it useful to put the excluders on early to give the bees a chance to get used to them before the supers were really needed. We also always provided an unobstructed path to the honey supers via an upper entrance. 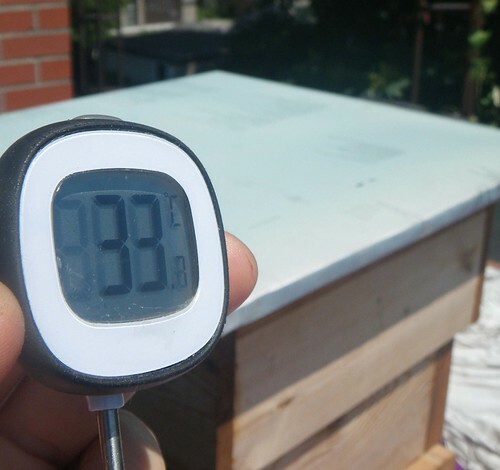 There are a few things you can with your standard langstroth roofs to help keep the bees comfortable during a heat wave. 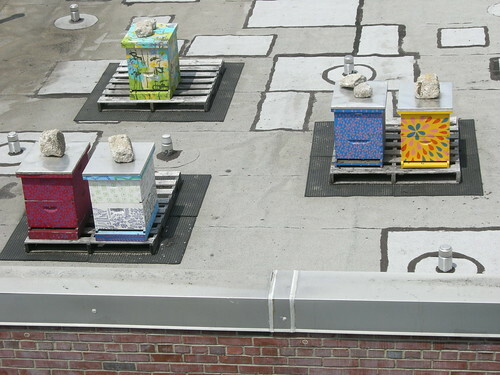 There are also a few design modifications well worth considering when building your own roofs that may further protect your bees from the intense mid-summer sun. Can't the bees just fan the hive to keep things cool? Yes, they will certainly try, but as amazing as they are, even bees have their limits. 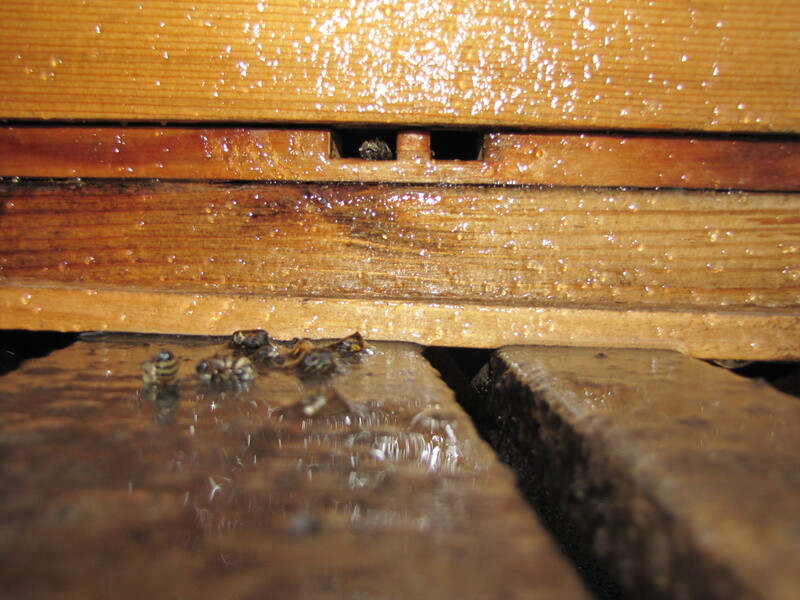 If it gets too hot they will shut down brood production, and in extreme situations it is possible to lose colonies. 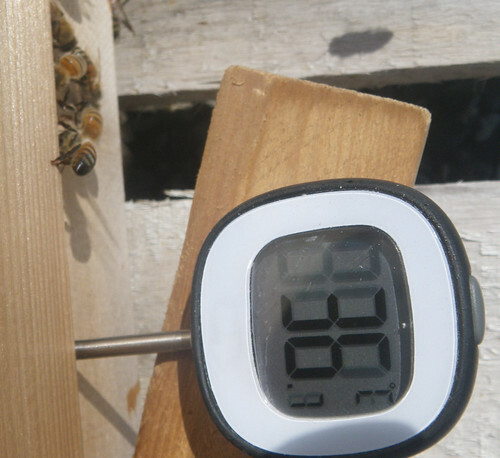 To get a sense of how hard your bees are working to keep cool, it's relatively easy to place a thermometer at your entrance(s) to gauge the temperature of the air being pushed out of the hive. 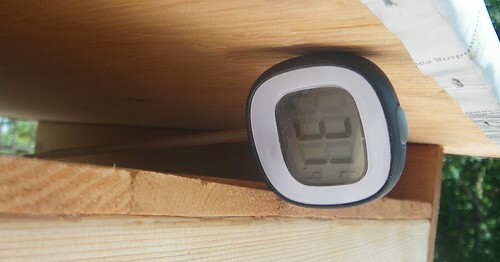 Keep in mind brood rearing requires a temperature in the 33-36°C (91 - 97°F) range. If your entrance temperatures are significantly above that, you may wish to take the temperature near the brood nest to see if they are winning the climate control battle. Even when things are not too extreme, why not take a few simple steps that might save your bees from wasting time and energy? Adding an upper entrance and tilting a telescoping cover back is certainly a simple way to offer some heat relief to a colony. In my region, it is generally advised to locate your bees in full sun. For those living further south, the conventional wisdom is to try and provide mid-day shade. If, like me, you have chosen a full sun location, you can provide shade only when the temperatures are unusually hot. 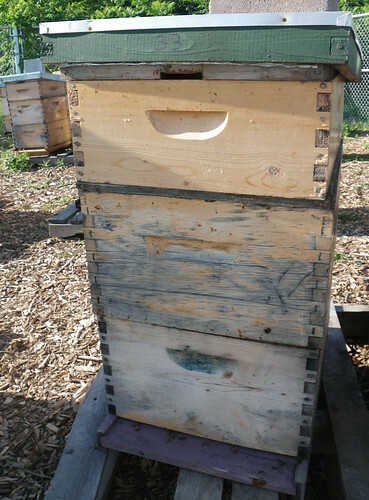 A simple, if temporary, way to add shade is to lay a few tree branches on top of your hive. I chose branches from a tree species known to be invasive in my area. Within a short period of time, this dropped the temperature of my painted roof down 3.4°C to 34.9°C (95°F). Of course, the leaves will soon dry out and shrivel. If you are experiencing an extended heatwave, you may wish to consider a more durable solution. The idea here is that the top-level creates a solar shield that effectively shades the bottom level, while simultaneously creating an air gap through which a breeze can pass, thus minimizing thermal conduction of heat downwards into the hive. The inspiration for this style of roof comes from the warré hive. 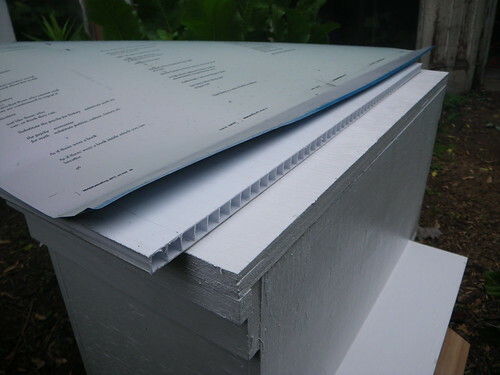 Corflute is the kind of material election signs are usually printed on. The air pockets in the material help insulate and minimize thermal conductivity. A warré style quilt helps keep heat in during the winter, but it also helps keep heat from the sun out of the hive during the summer. 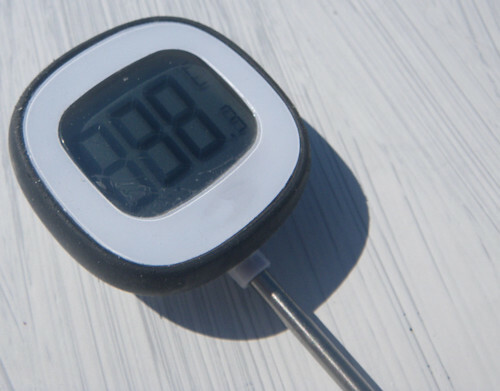 The thermometer I used throughout this post is a regular digital thermometer that one might use in a kitchen. 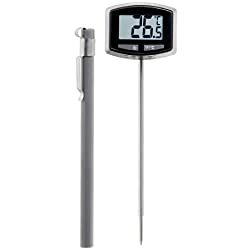 The main quality you are looking for in this tool is ability to adjust to ambient temperature relatively quickly. You can find one here on Amazon. There's lots of anecdotal evidence about the benefits of honey on allergies. I could also add my own positive story to that list, but the science looking into the matter still seems rather limited. So far a few studies have said it doesn't help, so it was nice to see some evidence that matches up with my own personal experience. Of course It still might depend on what you are allergic to, and how likely the pollen of that plant will be found in the honey you eat. This study checked specifically for allergic reactions to birch, and found some very positive results. The common arguments against honey helping with allergies is that people have allergy problems with wind-borne pollen, and bees tend to collect more of the heavier, sticky non-wind-borne pollen. It's is, however, important to remember that furry bees carry an electrostatic charge, which makes them pollen magnets, so they may very well be collecting some of that wind-borne pollen just by flying through the air.